Mash arrived in our care with two fractured legs. After delicate surgeries and an extensive recovery in foster care, he's now ready to find a home. Stray cat Mash was in a sorry state when he arrived at our shelter in August. 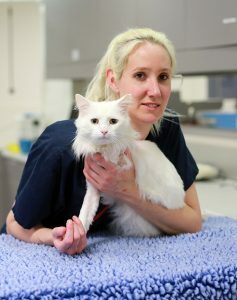 His front legs were badly mangled, leaving him unable to stand or walk. Mash’s injuries would have been excruciating. He was immediately given pain relief to help keep him comfortable. But, his spirits still remained high. Mash wasn’t able to move around, so he relied on our caring nurses to help him eat, drink and go to the toilet. X-rays showed that both of Mash’s front legs were severely fractured and would require surgery. 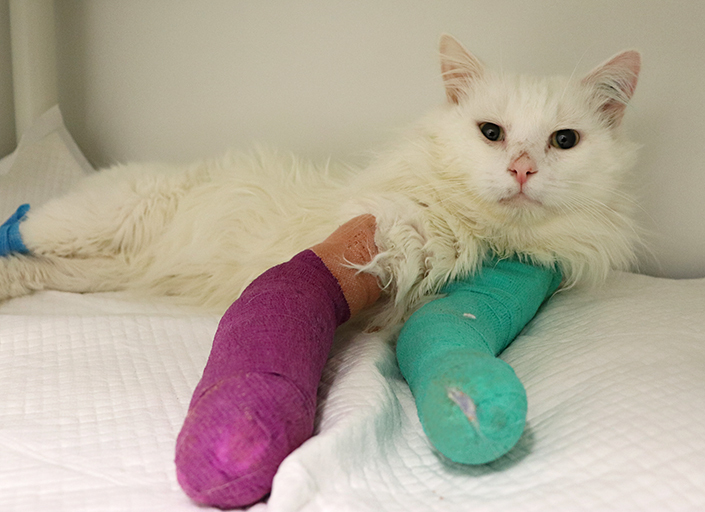 Despite the best efforts of our shelter medicine team, Mash’s left leg was so badly damaged that it couldn’t be repaired, which left vets with no choice but to amputate it. Fortunately, the fracture in his right leg could be fixed. Mash’s sweet nature melted the hearts of our vets and nurses. This was especially true for vet nurse, Mel. “Mash is one of the cuddliest and most affectionate cats I have ever met,” said Mel. 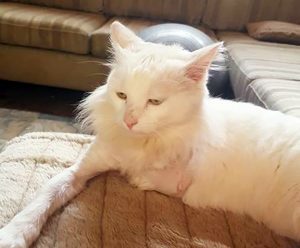 With an extensive and delicate recovery ahead of Mash, Mel knew she could give him the extra special care he needed, so she took him in as a foster pet. 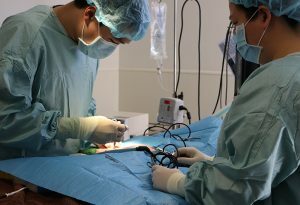 Being a senior vet nurse, I knew I would be able to take on the task of nursing him back to being a happy kitty,” said Mel. “Mash was immobile after surgery. I had to make sure the muscles in his back legs didn’t waste away, so I did physiotherapy with him every day. I also had to make sure he was toileting regularly. Mash had spent a lot of time unable to move around like a normal cat, which left his confidence in need of a boost. But, the brave cat gradually got back an all three paws. “It was truly amazing the day he started to slowly use his remaining front leg,” said Mel. More and more each day, he would realise that he could walk pain-free”. After more than a month in foster care, Mash is now up for adoption and ready to find a loving forever home. He’ll need to be an indoor-only cat to keep him safe. “Mash acts more like a dog. When I call his name, he just hops straight to me. He is quite a talkative cat,” said Mel. If you can offer a special home to this special cat, come and meet Mash (ID 1034649) at our North Melbourne shelter.